The ‘Momento de Amor’ initiative is being held, organized by the Madeira Forum in partnership with JM.FM, until February 14, to reward the passionate. From yesterday until next Thursday, all who pass through the Central Square of this shopping center will be able to qualify for a € 150 gift card offered by the Madeira Forum, whose winner will be announced live on 88.8 – JM.FM on February 14, in a broadcast that will take place between 12 and 16 hours. During the broadcast, JM.FM promises musical animation appropriate to the date and a lot of interaction with the visitors. To compete in the ‘Moment of Love’, simply follow the page of the Madeira Forum on Facebook, take a photo in the ‘spot’ for the purpose, send the photographic record to the page of the shopping center and wait for your photo with your ‘ half face ‘is the most voted, giving a gift card of 150 euros. 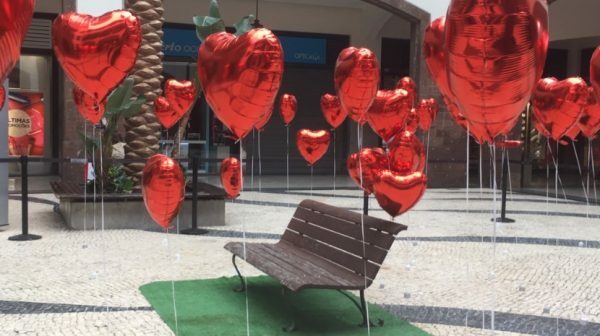 The Central Square of the Madeira Forum is already filled with hearts and decorations alluding to St. Valentine, and also has a garden bench that should be used to ensure the best photography.